SKU: N/A. Categories: Flies for Fishing, Flies, Vise Bases, Indicators, Nymph Flies, Trout Flies. Over the last several years, since I was shown the techniques for traditional wet-fly fishing by our Welsh friend Davy Wotton, we’ve experienced a steady increase in success with larger trout, and especially browns, by taking advantage of the feeding trigger stimulated when fishing with multiple flies. Traditional wet-fly fishing does not use weighted flies and so I merged some of Wotton’s techniques with my understanding of emergers to create a system that is the best of both worlds because it works at all depths. The top emerger has no weight, the middle is slightly weighted and the bottom fly is more heavily weighted .. and it works like a charm everywhere we use it, even when other methods aren’t working well. Go to our article Whitlock’s Emerger System – Top to Bottom to learn about the system and techniques. 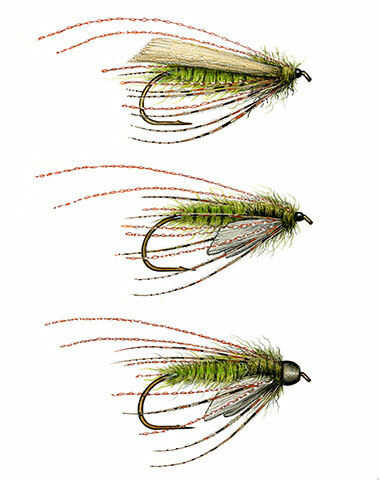 Please note that there is an error in with the fly tying recipes – the recipes don’t coincide with the fly drawing. Recipe 1 is for the top emerger and recipe 3 is for the bottom emerger. 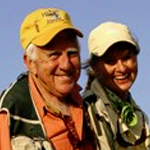 This has become one of our most favorite ways to fly fish.